I stumbled upon this book, and this post earlier this week. We, Americans, waste 40 percent of the food we produce. Author Jonathan Bloom thinks we should reduce our groceries by 25 percent to help alleviate waste. He proposes shopping smarter by planning ahead, loving your leftovers and canning and preserving foods. Here are some fun ideas for uses for stale bread and watermelon rinds. Before hitting the grocery store, I make a list. If I'm making something that calls for an ingredient I don't normally use, I find another use for it, so it doesn't go to waste. I also try to find a use for extra vegetable parts like beet greens or broccoli stems. How do you feel about using all of the vegetable or do you just toss in the trash (or compost)? This recipe fits in perfect with this sentiment. The other night I made a butternut squash soup. Sometimes I get lazy and toss the seeds, but this time I kept them. And I'm glad I did. 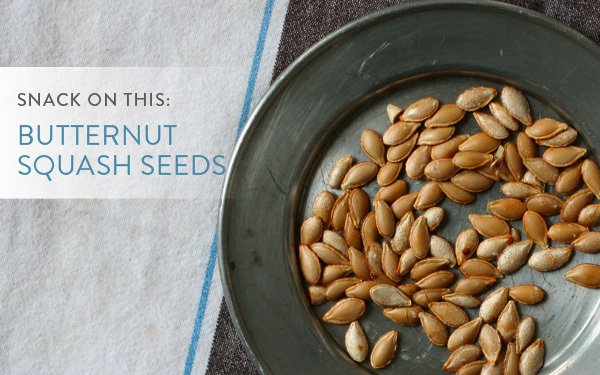 Those seeds make a great midmorning snack or add a nice crunch to a salad. The best part is that they came from the same squash who's flesh I turned into soup. Scrap the seeds from the flesh and set aside. Rinse, remove all the squash flesh and let dry overnight. Preheat oven to 325. Cook for 15 minutes or until the seeds are starting to brown. You might also hear them starting to pop in the oven. Remove and let cool before eating. Feel free to experiment with other types of squash. Enjoy!